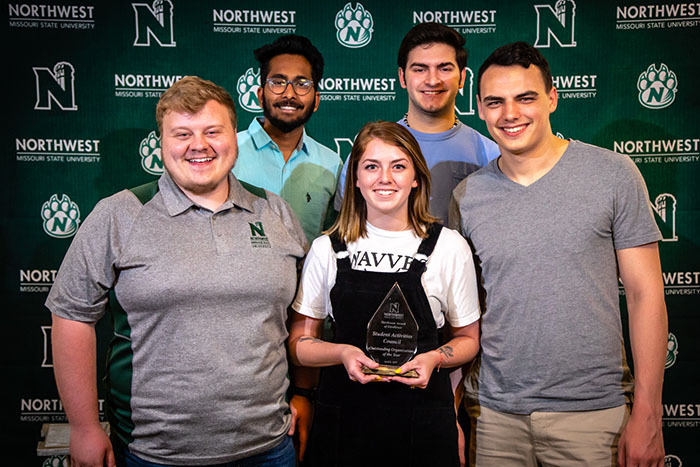 Northwest Missouri State University honored its outstanding student organizations, leaders and student employees April 8 during the University’s ninth annual Northwest Awards and Recognition Ceremony. 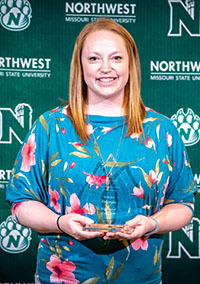 Traditionally, the last award to be given is the Student Employee of the Year, which went this year to Aly Copp, a senior human services major from Liberty, Missouri, who works as an office assistant in the Office of Human Resources. Copp’s nomination commended her leadership and eagerness to take on challenges and responsibility in her student employment role. 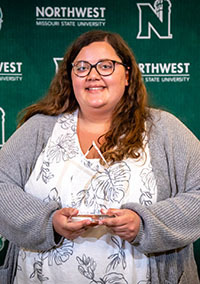 While Student Employee of the Year winners are selected based on standards established by the National Student Employment Association, McLain noted Northwest’s internationally benchmarked student employment program consists of about 950 student employees. They play a key role in the institution’s educational, research and operational excellence. The Office of Student Involvement also hands out awards recognizing outstanding students, advisors, programs and organizations. Northwest supports more than 200 student organizations on its campus. 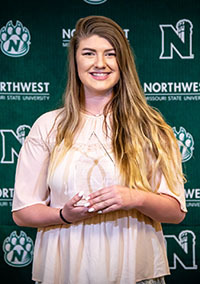 Shyla Kallhoff was named Outstanding Student of the Year Award, for demonstrated excellence in academics, community service, work experience, school spirit, achievement and leadership at Northwest. A senior Spanish and human services major from Omaha, Nebraska, Kallhoff’s involvement includes service as vice president and Inclusion Committee chair with Student Senate and president and director of lecture programming with the Student Activities Council (SAC). SAC was recognized as the year’s Outstanding Student Organization. 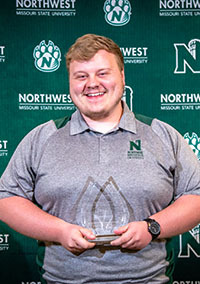 Megan DeShon-Runge, Northwest’s assistant director for Greek Life, was named Outstanding Organizational Advisor for her work with Panhellenic Council, and SAC President Drake Summers, a senior human services and psychology major from Excelsior Springs, Missouri, was named Student Organization President of the Year. The B.D. Owens Library recognized winners of its annual research contest, which is designed to encourage critical thinking and reward undergraduate students for research excellence. Papers are judged by a panel of faculty and librarians based on extensive use of scholarly sources and their application to the topic, a demonstrated ability to evaluate information sources, a responsible use of information and academic citation style as well as clarity, grammar and quality communication. 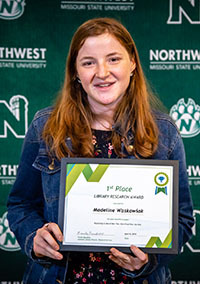 Madeline Waskowiak, a junior social science major from Omaha, Nebraska, received first place for her paper “Rationing in World War I: How Food Won the War,” written for Dr. Devlin Scofield’s fall 2018 course, Historian’s Craft. Her paper focused on Britain, Germany and the United States, paralleling their food campaigns and the effects on their citizens during wartime, showcasing how food won the war. 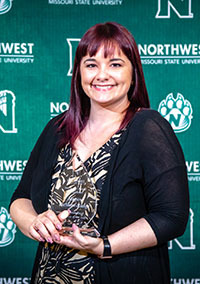 Dr. Katy Strickland who is in her sixth year as director of athletic bands and an associate professor of music at Northwest, where she also serves as the chair of the Department of Fine and Performing Arts, provided the day’s keynote address. Strickland focused her remarks on the importance of interacting with others in a wise way. A complete listing of the award winners appears below. First place: Madeline Waskowiak, “Rationing in World War One: How Food Won the War,” written for Dr. Devlin Scofield’s historian’s craft course. Second place: Courtney Cumpton, Bridget Cunningham, Marissa Hagen and Jamee Slagle, “Effects of Voluntary and Involuntary Task-Switching on Academic Performance,” written for Dr. Bradlee Gamblin’s experimental psychology course. Third place: Halston Belcastro, “Into the Wild: Jon Krakauer’s Avoidance of the Ugly,” written for Dr. Ashley Davis Black’s senior seminar course.